Renault Nissan head speaking to CNN's Richard Quest on the sidelines in Davos. 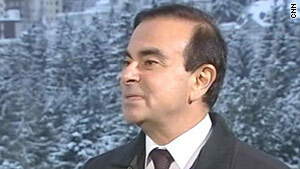 Davos, Switzerland (CNN) -- Even as competitors rushed into the marketplace with deals to woo away Toyota customers, the head of the Renault Nissan said he believes Toyota's woes will be temporary. "It is going to be short-lived. It is going to be on the short term," said Carlos Ghosn, chairman and CEO of Renault Nissan, speaking to CNN's Richard Quest at Davos. Toyota recalled 5.3 million vehicles in the United States, as well as vehicles in Europe and China, for problems related to stuck gas pedals. On Thursday Ford offered a $1,000 bonus for buyers in the U.S. who trade-in a Toyota. GM, Mazada and Hyundai also introduced new deals in the wake of Toyota's troubles. Will Renault Nissan do the same? "Some other car manufacturers (are) ... we won't," Ghosn said. "Our strategy in the U.S is a long-term strategy. You know, trying to get advantage of three or four weeks opening is not part of the tactics that we use." For Renault Nissan -- like other global carmakers -- China holds the greatest promise. "This is a car market which is very recent," Ghosn said. "That means Chinese consumers are discovering new brands, they are discovering new cars. So, it is an open book." The European market, meanwhile, faces a glut of too many manufacturers chasing too few customers. "You want to reduce (car capacity in Europe) by shutting down plants ... (and) by reducing the capacity inside existing plants," Ghosn said. "And you want to make sure also, that at the same time you are doing this, you are supporting other markets, Middle Eastern market, African market, Eastern European market, by building plants in these markets." Yet carmakers in Europe are hesitant to shut down plants. "There were plenty of opportunities to do it and nobody did it," he said. "And nobody did it for a very good reason -- the cost of shutting down plants in Europe would be very high."